As with any freezer food, these freezer biscuits are going to make your life easier! My family loves biscuits and gravy. But by the time I brown sausage and make gravy, mix together biscuits, roll them, cut them out, and bake them – I end up with a very messy kitchen and a lot of time spent trying to get breakfast on the table. Therefore, I used to only make this meal on special occasions like birthdays and Father’s Day. Have sausage pre-made, browned, and frozen in meal-sized portions. Make biscuits ahead of time, then freeze them to pull out and bake. If you recall, I typically make 12 pounds of Homemade Turkey Sausage at one time. It just makes sense. I’m already getting out all of the spices. I’m already dirtying a pot. Might as well just dirty a bigger pot and make a huge batch of sausage, right? Then I freeze the cooked meat in 12 quart-sized freezer bags. The night before I’m planning to make biscuits and gravy, I get out one bag of meat and put it into the fridge to thaw. Easy! Now how about the biscuits? I’ve learned to mix up a triple or quadruple batch of Quick Mix Biscuits, roll and cut, then freeze the unbaked biscuits on a parchment paper-lined cookie sheet. One mess, lots of biscuits. So easy! Once the biscuits are frozen, I transfer them to gallon-sized freezer bags. The night before I want to bake them, I place the desired number of frozen biscuits on a baking sheet, cover them with a cloth, then let them thaw on the countertop overnight. The next morning, all I have to do is slide the biscuits into the oven to bake while I quickly make Homemade Sausage Gravy with the pre-cooked sausage. Slice some fruit, and I’ve got a favorite, hearty meal on the table within about 15 minutes. My family will now be enjoying biscuits and gravy more often, thanks to these quick freezer methods! 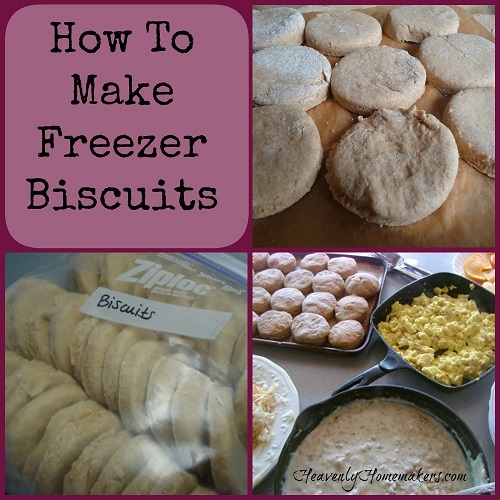 Have you tried freezing unbaked biscuits before? Making freezer biscuits is on my to-do list this week. Thanks for the recipe! Laura… here’s another really cheating trick for making biscuits – not freezing them though. Once your dough is a sticky ball, put a little flour right on your stone or baking sheet, transfer dough, do a few kneads and pat flat. Use a pizza cutter to make square-ish biscuits! You can kinda separate them after they are cut, still using the pizza cutter. Bake as normal, sometimes a minute more if they are all close together. No dirtying the counter and cutting individual biscuits! Plus they stay more tender from not having the dough worked as much having to mess with re-rolling the scraps! Thanks Corrie and Laura! I used Corrie’s idea for patting the dough down and cutting it into squares with a pizza cutter. Then, I used Laura’s idea to freeze the unbaked dough. I took them directly from the freezer to the oven this morning and baked them for breakfast, adding a few more minutes to the bake time. They were light and delicious and so good with lots of butter and all-fruit jam. Loving the square biscuit idea… No one in our house cares what shape the food is as long as it tastes good! Yep, I do it all the time! On a better note, I love your freezer and make-ahead meal ideas. Now all we have to do is get a freezer…..
Great breakfast idea, Laura, and one that would be well received around here. We are already huge fans of your homemade breakfast sausage. I also like the ease of making square biscuits, Corrie! Now I can make a double batch, cook what we’ll use that meal and then I can freeze the rest! Fabulous! Can you put the frozen biscuits right in the oven and just bake longer? I have had mixed results with baking the biscuits that have been frozen. I am wondering if the baking powder loses it’s rise after being frozen for awhile. I have had some that baked and rose and tasted fine and then some that were like hockey pucks. After reading a tip online I now mix my biscuits and scoop them out with a 4 T. scoop and them just flour my hand and pat them flat. They are ready for the oven in no time and I know they will turn out well. One thing about the sausage gravy that can also save time is to go ahead and make a large batch and then freeze the already prepared gravy. Thaw it in the fridge and then reheat in a saucepan stirring often and it is as good as fresh. My recipe has an option for “drop biscuits.” It call for using just a bit more milk, making a stickier dough. Then you just drop spoonfuls of biscuits onto your prepared baking pan. I never have enough clean counter space to roll out and cut, so this works great for me. we love drop biscuits! especially my daughter, who insists on making them. the texture, or crumb, is different than rolled biscuits. i’m glad to see someone else who enjoys them too! Usually they eat two each if there is gravy and eggs too. Do you always thaw these before baking? Yes, thawing them works best. Hi! I love your website and have been a reader for years. I just wanted to say I made these biscuits and baked some to eat right away and froze the rest. When I baked the frozen ones they didn’t rise at all. :( Do you ever have that problem? Hmmmm….that has not been a problem. I am not sure where to trouble shoot on that one since the ones you baked immediately rose for you. I hope they still tasted great!